Ladismith Country House is situated 7km outside the town of Ladismith, alongside Swartberg mountains and on the popular R62. It is a scenic, three hours drive from Cape Town or two hours drive from George Airport. The guestfarm is privately owned and managed and offers the discerning holiday maker or corporate guest the perfect Klein Karoo experience with a theme of “home, away from home”. Ladismith Country House is situated on 60 hectares of what can only be termed as a nature lover’s paradise, offering a variety of birdlife, fynbos and succulents. The Manor House consists of five individually and tastefully decorated suites that provide the warmth and relaxation that only the Klein Karoo can satisfy. Each suite has it’s own entrance and offers a patio with direct access to the beautiful garden. The 5 en-suite rooms offer air cons(hot & cold), cotton bed linen, safes, coffee & tea making facilities. 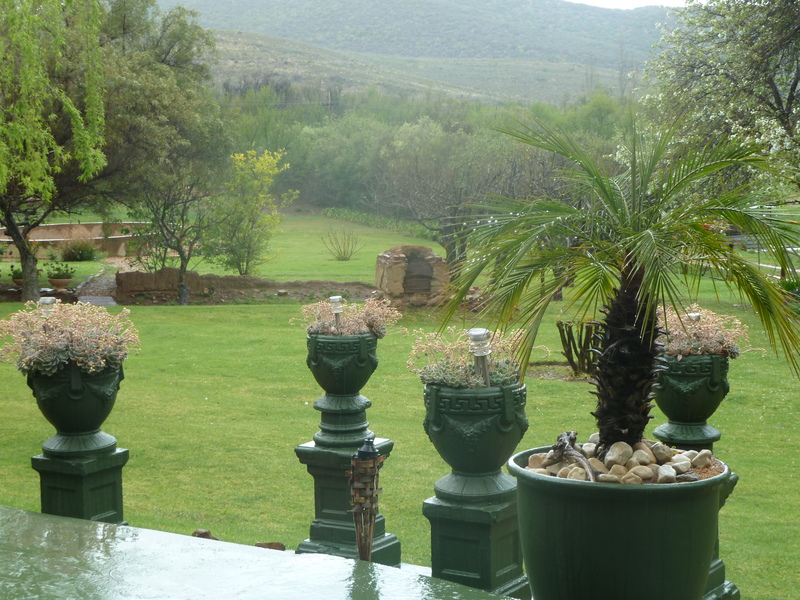 Ladismith Country House offers a heart-warming breakfast in the perfect Karoo setting. Enjoy a leisurely breakfast in our dining room or on the patio overlooking the garden and Klein Karoo landscape with the welcoming sounds of guinea-fowl, hadeda, wild geese, partridge and pheasants. Our Bistro provides wholesome home-cooking for our guests. During the day, enjoy scenic walks on the farm and do hiking trails within 5km of the Country House before heading out to the famous Seweweekspoort, the gateway to the Greater Karoo. The Seweweekspoort is a mere 10 minute drive from the Country House and is a must when travelling on the R62. The Poort offers an abundance of unspoilt beauty and breathtaking views. When doing a day trip, guests can travel through the poort and turn towards Bosluiskloof and Gamkapoort dam. Seweweekspoort peak is the highest point in the Western Cape province. The annual Seweweekspoort Mountain Bike Race passes the Country House and if you are a mountain bike lover, bring your bike along and enjoy scenic back roads. For the hiking enthusiast there is the famous Elandsberg mountain trail. It takes you all the way to Stanley’s light or Towersig mountain trail, which is one of Ladismith’s famous landmark’s. Ladismith also has a 9-hole golf course and squash court. Ladismith is situated in the most beautiful region of the Klein Karoo. The beautiful town has a rich architectural heritage and several buildings that have been declared National Monuments. Ladismith, as with the rest of the Klein Karoo benefited from the ostrich feather boom period at the beginning of the previous century. If you want to do your own day trip, discover Ladismith by visiting historical churches, Zoar & Amalienstein and continue further (30min) to Calitzdorp for tasting Champion Port wines at several Calitzdorp cellars. Then head for Oudtshoorn (30min) via the scenic Kruis River Road passing, Red Stone Hills to the famous Cango Caves and Cango Wildlife Ranch or visit one of several Ostrich Farms in the area. Within an hour you will be back at the Country House to enjoy the serenity and tranquility of the farm. For interesting finds, wander around the town and discover gifts in hidden places, or purchase local preserves and jams. Ladismith wines and local brandy can be tasted at the local Wine Shop. Otherwise, just chill in the shade of the apple trees on the loungers at the swimming pool, filled with fresh mountain water or enjoy a cold drink. At night, star gazing from your patio or the lawns will capture you. Guided cultural and biodiversity tours can be arranged for you to discover Ladismith, Calitzdorp, van Wyksdorp as well as the rural areas and scenic landscape and environment of the Klein Karoo. Game drives can be arranged as well.